When you need a quick but nutritious dinner to fix for the family on a busy weeknight and want to minimize mess, this chicken with cranberry sauce recipe will become your go-to. With just four ingredients and a couple minutes of preparation, this chicken recipe is an easy, fix-and-forget-it way to serve your kids a healthy dinner they’ll actually eat. We usually think of cranberry sauce at Thanksgiving as well as Christmas but it is also great during the rest of the year. It is delicious in recipes like this great weeknight chicken recipe as well as glazes and sauces. Preheat the oven to 350 F. Spray a 9 x 13 baking dish with cooking spray. Place the chicken breasts in baking dish. Sprinkle French onion soup mix evenly over chicken breasts. In a medium bowl, whisk together cranberry sauce and salad dressing. Pour over the chicken breasts. Bake for 45 minutes or until the chicken is cooked through. You can buy already made cranberry sauce or make your own. For homemade, cook down fresh cranberries with a little sugar or another kind of sweetener. The berries can be cooked until they pop and made into a smooth sauce, or simmered for a shorter amount of time so some of the berries are left whole. The natural pectin in the berries thickens the sauce. Catalina dressing is similar to French dressing but is not as creamy and has a brighter red hue. It is a combination of tomato ketchup and sweetener as well as tangy ingredients like lemon juice, Worcestershire sauce, and Dijon mustard. You can purchase store-bought or make it from scratch. 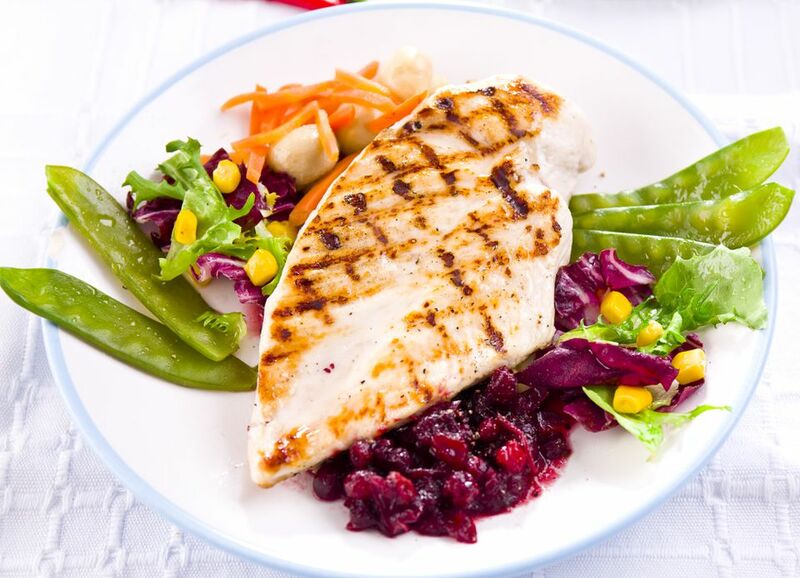 This chicken dish is perfect as a main dish for dinner with a side of rice and a green vegetable, but it is also great sliced and served up with extra cranberry sauce in a sandwich, or added to a fresh green salad with crumbled blue cheese and some chopped nuts, such as walnuts or pecans for added crunch. You can also turn it into a chicken salad by adding a light mayonnaise dressing and maybe a few halved grapes and dried cranberries tossed in. If this sweet and savory chicken recipe is a hit in your house, you may want to try a few other dishes at dinnertime. Salmon is delicious when topped with a cranberry sauce, and pork loin is complemented nicely by an apple cranberry sauce. For a fun appetizer or dinner, serve meatballs simmered in a cranberry sauce studded with pineapple.